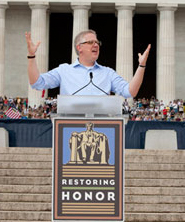 Since the weekend, America’s journals and airwaves have seen a torrent of reports of and responses to the event on Saturday, 8/28, in Washington, DC at The Lincoln Memorial, called together by Glenn Beck and labeled, “Restoring Honor in America.” Great strain has been exerted by observers and reporters toward explanations of “What does this mean?” or “What was he trying to do?” (assuming of course, that it was all Glenn Beck’s attempts to manipulate Americans for some personal agenda). Many wondered what really lay behind Beck’s assertions and challenges that it was not to be political. Old faithful Chris Matthews whose very flesh is saturated with politics and whose perceptual faculties conceive of little else, brought in his analysts to divine what the actual motivations and intentions were. I have always referred to myself as, at least in thought, a jack of all trades and master of none. I don’t have graduate degrees and/or published books. But, I have an uncommon disposition to analyze the actions and virtues of humans and their societies. And I feel no presumption (or pride – it’s a personality idiosyncrasy that drives me) in saying that I’m more studied than average across the totality of the areas of philosophy, theology, social structure, psychology and science than the average American, if not necessarily in each area individually. I’ve always been that way, but particularly in recent years as a disabled man, I’ve had relatively little more pressing on my attention. There is much to say about this, so I’ll probably need to restrain my impulses. So, let’s do something really strange and take Glenn Beck at his word and the event for its title. And to walk (E)humbly with your God? Though Matthews and other commenters may puzzle, it is not so difficult to imagine that people might pose establishing honor as not a tactic but a priority. The event began with honoring America’s military and focused on dedicating ourselves to God and His priorities before ours. Ben Stein, with whom I’ve disagreed on fiscal necessities (he’s a Keynesian-howbeit a generally conservative one-, I’m not), has also contended for a recognition of God in society and science, as well as having written a book about “The Real Stars” about which I’ve heard him speak many times. Distinguishing them from the relatively trite celebrity of our show business stars, Stein says the real stars are those who wear a uniform or battle gear and stand between our diversions and pursuits as insulation from external threats that most of us know little about. I wish there were a stronger way to agree with Stein on this than the tired “110%.” In 475 B.C., Plato wrote in “The Republic” of the three general categories of men in a society. There were philosophers, producers and warriors. Our warriors are a character and caliber of men that I can’t fully understand who voluntarily today give life, limb, suffering and deprivation so we all can do what we do under their umbrella and I can gaze at my navel. As much as I can’t understand those men, I even more can’t understand those who don’t honor them or wince in awe of what they give and what they suffer; and less still those speculate about the “real” motives of those who do. Beck had a "Black Robed Regiment" of clergy from all faiths that make honoring God a priority. I’ve heard liberals remark on the irony that many evangelicals reject Beck because he is a Mormon that they don’t even consider a Christian. Sure, this society of 300 million has the boorish and the racists that liberals want to paint all conservatives as. And yes, some evangelicals have strong questions about Mormonism or even Mormons personally. So what? Some people believe they have been abducted and examined by space aliens. Those things aren’t terribly relevant. And what of Beck’s Mormonism and his call for believers to honor God as a priority? Let’s look both at Beck as a Mormon and his relationship to orthodox Christians and his significance in summoning men to an event on restoring honor and commitment to God. Critics will say that orthodox Christians only collaborate with Beck inasmuch as he shares their conservatism. First a bit of theological nitty gritty. I am an evangelical Christian and a student of orthodox Christian theology. And from that perspective, the specifics of Mormon theology are…let’s say a little peculiar. But, there are perspectives of Catholicism with which I disagree while I know very well of sober, thoughtful and pious Catholics. Speaking of Catholicism, the largely unified Catholic Church rightly questions the many not-so-unified Protestant fellowships. Other denominations have doctrinal statements with which I disagree. Heck, probably most of my own church wouldn’t entirely agree with my beliefs and practices. I even am certain that if my strenuously developed beliefs were examined by Jesus, there would be problems there, too. Let’s not even talk about our behavior, which is why Christ is. But, all of us hold to the core of Christian orthodoxy of The Trinity and the divinity and redemptive work of Christ. Peculiar details aside, so do faithful Mormons. I feel very strongly that we should be beyond cautious about renouncing the Christianity of anyone who confesses Christ. I even take that to Barrack Obama, much as I think both his longtime pastor and his social objectives are a scandal to the ideals of Christianity. His efforts in governance of America are a horrible corruption of both Christian and American values to me. But I also know how the embrace of some low-level philosophical assumptions can produce some bizarre ideals in the most intelligent and purposive idealists. But I have to admit that some things are more difficult to swallow than the typical political maneuvering. It must be ideology and not genuine grief about the lack of economic vitality that persists in policies that have never succeeded anywhere and constantly blames Bush and Wall Street for "creating a hole that it will take us a long time to climb out of." Besides the fact that Bush and Wall Street only kept rolling the dice on corruptions of the market that were introduced by liberal government, and that many partisans on the street actually believe that nonsense, surely he must know and be just the slightest bit embarrassed that a whole lot of people know 100 proof BS when they hear it. Liberty is a Christian value that today allows all faiths to flourish in America, asking only that they accept the unalienable rights of others that are grounded in a transcendent reality and unalterable by men or their devices. And if the more ambiguous faith of Thomas Jefferson can declare our creator endowed unalienable rights, we should welcome a passionate and assertive Mormon promoting a standard of primary fidelity to God and honor. I found your article quite interesting. It seems more and more Christians are trying to justify the faith of Glenn Beck to make it sound like his Mormon faith is the same as that of Christianity. "First a bit of theological nitty gritty. I am an evangelical Christian and a student of orthodox Christian theology. And from that perspective, the specifics of Mormon theology are…let’s say a little peculiar. But, there are perspectives of Catholicism with which I disagree while I know very well of sober, thoughtful and pious Catholics."